New Delhi: People who inform, educate, instruct, enlighten or train others, are rightfully deserving of the prestigious title of ‘Edupreneur’. Pro Vice-Chairman of DPS Panipat City, Mr. Amit Rana, was felicitated at the Elets 8th World Education Summit, where he was conferred with the special ‘Edupreneur 2017’ for his exemplary role in the field of education. 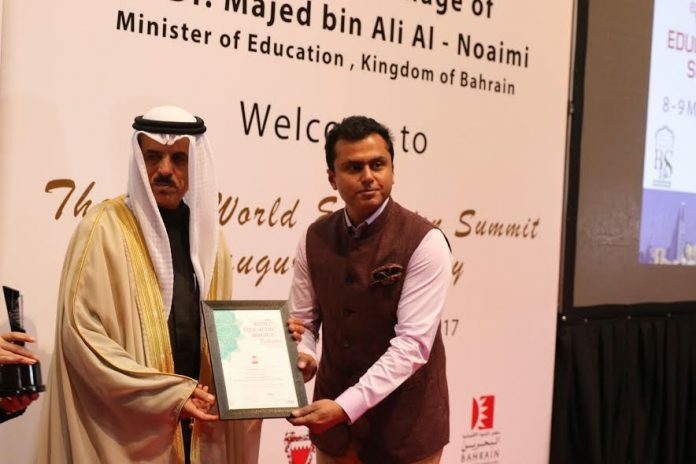 The World Education Summit was organised to create a global knowledge-sharing platform for thought leaders, policy makers, education leaders and industry leaders to discuss various aspects of imparting quality education. The aim of this conference was to initiate change in the entire education system with its theme of ’Innovating for a better future’. The ‘8th World Education Summit 2017’ was supported by Digital Learning, Asia’s premier magazine on the ICT for Education and also Bahrain Bayan School. Mr. Amit Rana has passionately pursued his interests in school education; promoting new school ventures and addressing schooling, sports, employment and livelihood related issues. He continues to pursue education related issues and enterprises striving to bring about a paradigm shift in these areas. He is keen on building international collaborations to work towards these goals. He brings a wealth of understanding and experience in school education related matters including networking that is critical to the achievement of his goals. He has always been a very proactive person and has involved himself in all the activities of the school leading to a holistic learning environment. DPS Panipat City fraternity joins in wishing him many more honors for his exemplary work in the field of education.